Customers who pre-ordered a Galaxy S10e, Galaxy S10 or Galaxy S10+ have been receiving their units since yesterday. There have been some complaints from customers in the United States about their orders. Quite a few people have said that they received their units in unsealed boxes. When they took their units out of the shipping box, they found that the seal had already been cut open. That’s unusual because the handset’s box normally has tape on either side that is uncut when the unit is shipped. These complaints have largely come in from customers in the United States. It doesn’t have anything to do with one particular carrier as well. Customers who bought them from different carriers have mentioned the same thing. Those who picked up unlocked units noticed some discrepancies with the tape as well. The reason behind this is not entirely clear. Perhaps a missing manual or screen protector forced the unsealing of these devices once they had been sealed for shipping. None of the reports mention anything about the box’s contents missing so nothing has been stolen. One customer did mention that since the Galaxy S10 box didn’t have any seal stickers, all of the contents had spilled into the shipping box, but fortunately nothing had been damaged. Some customers have reached out to their carriers with the complaints. 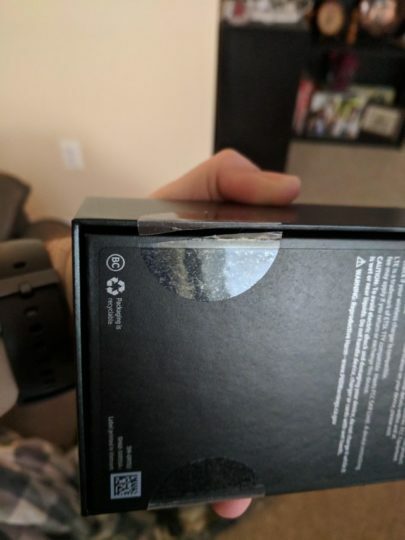 The customer support staff has told then that the boxes should absolutely not have arrived unsealed. They have either been sent replacements or told to exchange their units at a carrier store starting today as the Galaxy S10 has now gone on sale. Have you noticed something similar in any other market? Do share your experience with us in the comments below. The S10E I got has the screen protector, had the EU seal intact and came with the plastic wrapping around it. Yeah, that’s exactly what they should do. Do not accept if seal is broken! Get a new one. Dunno what you are talking about, but the unit I got in Moscow has a “Do not accept if seal is broken” seal on it. They’ve cut it in front of me to fill warranty papers. P.S. The site is broken in Safari. Post comment button does not appear. Just to reiterate what you said about the website in Safari. The site is broken really. Display is awful in landscape mode on iPads. I know this is a Samsung site…but, come on. You know what..it should work into every browser it doesn’t matter it it’s Samsung or something. Apple site works fine whatever I use to open it :). But of course I prefer Samsung browser cause it is fast as hell and I got adblock. Sammobile have a lot of bugs since new look version. I use Safari on iPad Pro 11. On Landscape mode, part of the details(Such as “By Adna F/ 1 day ago) about a post is slammed on the post topic itself. There is also a problem about how the links at the bottom of the page aligns(News, Firmware, Utilites, Join Sammobile). Open the website on an iPad pro in landscape…even in portrait and see what I’m saying. When I activate comment input window the Post Comment button does not appear beneath it like it does in Chrome. So I can type comment, but no apparent way to send it.